and silently downloads it into your phone for free! Watch this video to see how the system works. Watch this video to learn how to use the app. Watch this video to learn how to exchange highly targeted and 100% current contact data with just a click! We’re the people at EpicHub.com, LLC! In everything we do, we believe in the power of honesty. At Epic, we use the power of friendship to create systems that are honest, reliable, protective, and empowering – just as a good friend should be. The first system we created is the Epic Contact App. The Epic Contact App combines the powers of honesty and friendship to quietly share contact data within your circle on a 1 to 1 basis. If a contact of yours changes their data, we simply update you automatically. There’s nothing more to it. What is the Epic Contact App? The Epic Contact App uses a simple closed-loop system between you and a friend to keep each of your phone’s contact data current on a 1 to 1 basis. 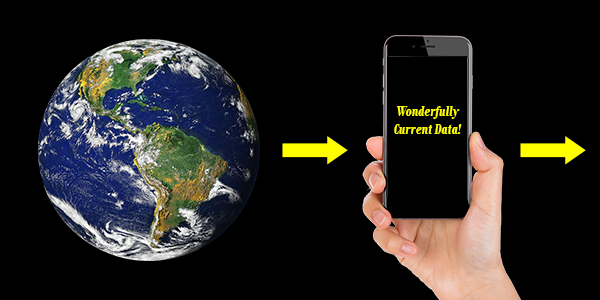 If your friend changes his data, this app simply updates your phone in real time. If you change your contact data, this app simply updates his phone. That’s it. No one else has access to your data. Ever. In 2012 alone, 30 Million out of the 127 Million working Americans changed jobs. That means 20% of the people you have in your contact database changed some, or all, of their contact data. And this trend is increasing! That’s why you need an automated system to keep your contact list current. The Epic Contact App only shares your data with the people in your contact database. Those people already have your data anyway – we just keep you current. No other information is shared – Ever. The Epic Contact App is an automated system that simply monitors contact databases for change, then simply updates your circle’s contact data in real time. And even if you forget to update your own data in Epic, we still catch your change when you tell a friend and they change your data in their phone. We simply send you an email asking you to update your contact data in Epic, then we update your contact list. How much does the Epic Contact App cost? The Epic Contact App keeps all of your contact data current for free. And you will always have unlimited access to your data. The only fee we charge is $4.99 should you ever wish to repopulate a new phone with 100% current data or to populate your phone's default contact list. At Epic, we absolutely HATE both spam and telemarketing phone calls. We consider them to be both irritating and an amazing waste of our time. We simply believe that irritating people is a really bad way to sell anything. Your phone. 100% current contact data. 4. Clean and Sort your database for the last time! Yay! 5. Click “Invite” and you’re done. Simply click your way through all of the Epic Contact App’s options. The only data you ever enter is when you first create your account, then update your account should it change. Even if you forget to update and share changes to your friends list, we still catch any changes you need to make. If you tell a friend that your data has changed, and he enters it into his phone, we catch the change and simply send you an email asking you to update your data. Sharing contact data has never been easier. The Epic Contact App gives you three QR codes that you can show people you meet. They are: 1. Full Contact Data, 2. Limited Contact Data, and 3. Business Contact Data. Simply show the QR code of the data you want to share, and let your friend scan your QR code with his phone. That’s it! You’re now connected – and each of you will stay current as long as he is in your database. Simply enter any changes to your contact data into Epic, then click “Update.” That’s it. Problem solved. And should you ever want someone to “lose” your contact data, simply delete them from your database, then change your contact data, and click “Update.” Everyone in your circle gets your new contact data – but not the deleted person. They wind up with bad contact data. With a simple click, the Epic Contact App allows you to simply and easily repopulate a new phone with 100% current contact data! The Epic Contact App will even translate iPhone contact data to Android contact data with just a click! Or go from Android to iPhone just as easily! We charge a per use fee of $4.99 for this service. It’s how we make money. Switching from an iPhone to an Android? Or from Android to iPhone? Switching has never been easier! 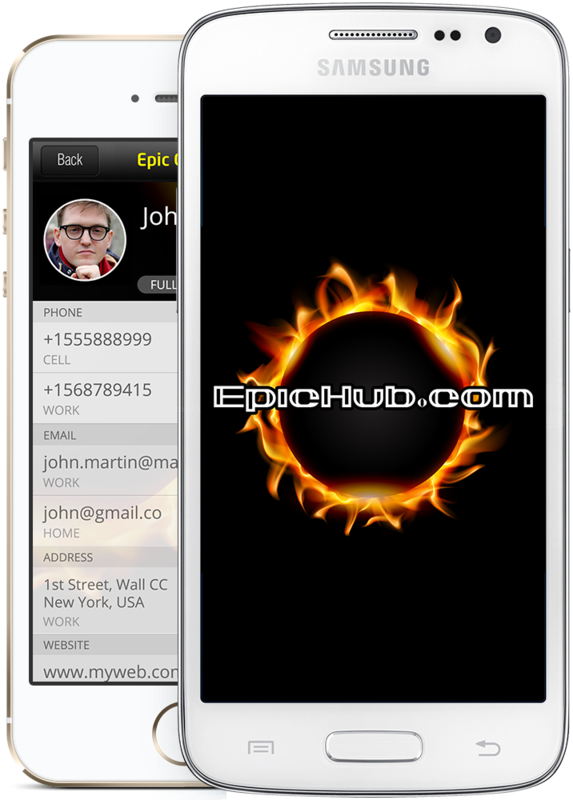 The Epic Contact App allows you to upload your contact database to the Epic Cloud, where with just a click, you can download your data in either iPhone or Android contact data. Simple. Easy. Done. The Epic Contact App charges $4.99 per use for this highly beneficial service. The Free Epic Contact App for Business! Simply have your employees download and install the Epic Contact App into their smartphones. As long as your employees keep their contacts in their phones, and you allow their phones to automatically update your company’s contact database, then the Epic Contact App will keep your business’ contact database 100% current – FOR FREE! Welcome to the future! Welcome to the crowd sourcing power of smartphones and the Epic Contact App!